Egyptian giants Ahly strolled into the African Champions League group stage with an easy 3-1 victory at Gabon's C.F. Mounana on Saturday to complete an emphatic 7-1 aggregate win. 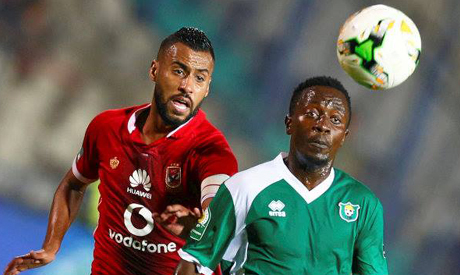 Leading 4-0 from the first leg, it did not take long for Ahly to assert control in Libreville, with winger Mido Gaber giving them an early lead. In-form Moroccan striker Walid Azaro doubled their lead before David Massamba netted a consolation for Mounana on the stroke of halftime after a mistake from goalkeeper Mohamed El-Shennawi. Walid Soliman completed the rout with a late strike as Ahly eased through. The Red Devils are looking to make up for last year's disappointment when a final defeat by Morocco's Wydad Casablanca prevented them from winning a record-extending ninth title. Gaber ended the tie as a contest as early as the eight minute, finding the bottom corner with a precise low shot from the edge of the area to kill off Mounana's slim hopes. Azaro made it 2-0 on the half-hour mark when a cross from Tunisian left-back Ali Maaloul eluded a defender and found him unmarked to volley home. Central midfielder Amr El-Sulaya could have extended the gap further in the 36th minute but fired over the bar with the goal at his mercy as Mounana's defence was sliced open far too easily. Massamba netted a consolation for the hosts, who played in an almost empty stadium, two minutes before the break. His low free kick went under the wall and squirmed beneath El-Shennawi, who earned a call-up for Egypt's two friendly games against Portugal and Greece later this month. Both sides labored in a dour second half but Ahly still managed to add a third with seven minutes remaining, Soliman rounding the keeper to slot into an empty net after a defensive lapse.